Rule of 6ix: What's the difference between one kid with a fever and one without? What's the difference between one kid with a fever and one without? A paper out last month goes a little way to answering a question I have had for a while: what are the major causes of fevers in children? Imagine this: your child goes to the doctor, they have a fever so they might get given antibiotics or they might be sent home for bed rest because of a non-descript 'viral' infection. But what is that non-descript virus? and how is it causing feverish disease? Maybe if we knew exactly what was doing this we may have some chance to prevent it. Fevers are an annoyance and in some cases can even be life threatening. Often times they are your bodies way of helping clear an infection. Your body will 'see' and detect infectious (and potentially dangerous) micro-organisms like viruses or bacteria and set off a chain reaction of chemical signals resulting in a rising temperature. But fevers may also be caused by a range of other ailments: arthritis, cancer or basically anything that causes inflammation. This paper in PLoS ONE suggests that we should delve into those children's viromes to see what is making them sick. Using next generation sequencing of nasopharyngeal swabs as well as plasma blood samples from febrile and non-febrile American children, they attempt to tease apart they causes of their illness. They also looked with PCR to detect viruses more specifically. This allowed them to essentially cover all viral bases in a comprehensive manner and hopefully detect what was truly in there. However, this approach is only based on looking for viral genetic sequences and no search for the actual virus was carried out. This means that those viruses detected could may never have infected the person, could have come directly from the environment or had been recently cleared by the immune system. WIthout virus isolation we cannot be sure to what extent a viral sequence is associated with a certain condition. The viruses they found by PCR and deep sequencing. In some cases this knee-jerk reaction to infection actually can damage you and can even result in seizure and death. Diagnosing the cause of fevers and treating early in thus a major concern and of the major issues of fevers is that they can be set off by a multitude of pathogens, the majority of which we have never really studied in much detail. Hence this group spending their time and money investigating it. Unexplained fever (UF) is a common problem in children under 3 years old. Although virus infection is suspected to be the cause of most of these fevers, a comprehensive analysis of viruses in samples from children with fever and healthy controls is important for establishing a relationship between viruses and UF. We used unbiased, deep sequencing to analyze 176 nasopharyngeal swabs (NP) and plasma samples from children with UF and afebrile controls, generating an average of 4.6 million sequences per sample. Comparing viruses seen in febrile versus afebrile kids. Spot the differences? An analysis pipeline was developed to detect viral sequences, which resulted in the identification of sequences from 25 viral genera. These genera included expected pathogens, such as adenoviruses, enteroviruses, and roseoloviruses, plus viruses with unknown pathogenicity. Viruses that were unexpected in NP and plasma samples, such as the astrovirus MLB-2, were also detected. 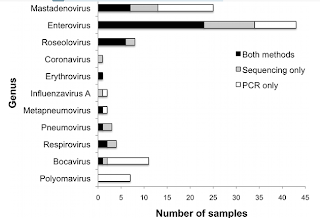 Sequencing allowed identification of virus subtype for some viruses, including roseoloviruses. Highly sensitive PCR assays detected low levels of viruses that were not detected in approximately 5 million sequences, but greater sequencing depth improved sensitivity. On average NP and plasma samples from febrile children contained 1.5- to 5-fold more viral sequences, respectively, than samples from afebrile children. Samples from febrile children contained a broader range of viral genera and contained multiple viral genera more frequently than samples from children without fever. Differences between febrile and afebrile groups were most striking in the plasma samples, where detection of viral sequence may be associated with a disseminated infection. These data indicate that virus infection is associated with UF. Further studies are important in order to establish the range of viral pathogens associated with fever and to understand of the role of viral infection in fever. Ultimately these studies may improve the medical treatment of children with UF by helping avoid antibiotic therapy for children with viral infections. As I said previously, the group only looked at viral sequences. No viruses were isolated or grown from these samples which makes it a little complicated in drawing conclusions based on this data. But it is extremely interesting and worthwhile and perhaps in some instances may give us a less biased view into the virome. We all harbour viral sequences. 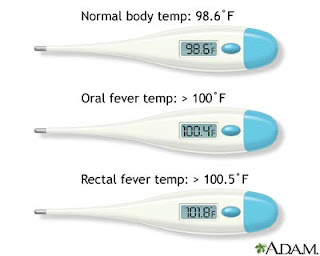 Even the 'healthy' control populations when you look at their upper respiratory tract and circulation, indicating that the issue of fever versus no fever may be more complicated than expected. 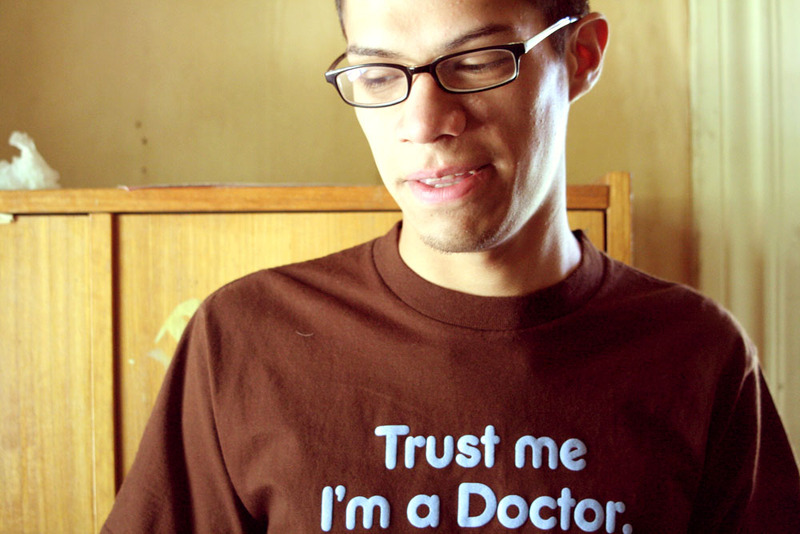 Maybe some people are much easily able to withstand disease progression from an infection. They only looked at plasma and at the upper respiratory tract. Many other parts of the body could be sampled in the future to more comprehensively investigate how the virome of a particular is associated with any particular condition or disease. The digestive tract, urogenital tract or blood cells (not plasma) could and should be investigated. Causation cannot be determined from this study. And they even say that this was not the aim of the investigation. To determine causation that a particular virus caused fever in kids one would have to fulfil Koch's postulates. Fever could have been associated with bacterial exposure/infection yet this was not looked at here. Perhaps this may have been more obvious to the diagnosing clinician and antibiotics would have prescribed. In conclusion, this is an interesting paper but it is in a sense quite preliminary. They have defined their methods and proven they can detect a wide range of viral sequences in clinical samples. But at the minute it is rather difficult to conclude anything else from this. I look forward to further characterisation of the viromes of multiple other tissue samples and even the characterisation of the viruses they identified. Perhaps they will represent entirely unknown disease causing viruses. Thank you for calling attention to these problems. I believe men and women ought to be skeptical of yet another drug program, and possibly inquire for non-pharmacological treatments before accepting drug treatment options. Regrettably, with mass-advertising of medicines in this country, we've arrive at take schedule drugs as a normal of treatment instead of the exception.